April 10, 2017 – NASA’s Solar Dynamics Observatory (SDO) captured images of an active region at the sun’s edge that produced several M5-class (medium sized) flares over a ten-hour period on April 3, 2017. These were the strongest flares of the year so far. Some coronal mass ejections (which hurled clouds of plasma into space) were also associated with some of the flares. SDO captured these images in extreme ultraviolet light, a type of light invisible to human eyes. 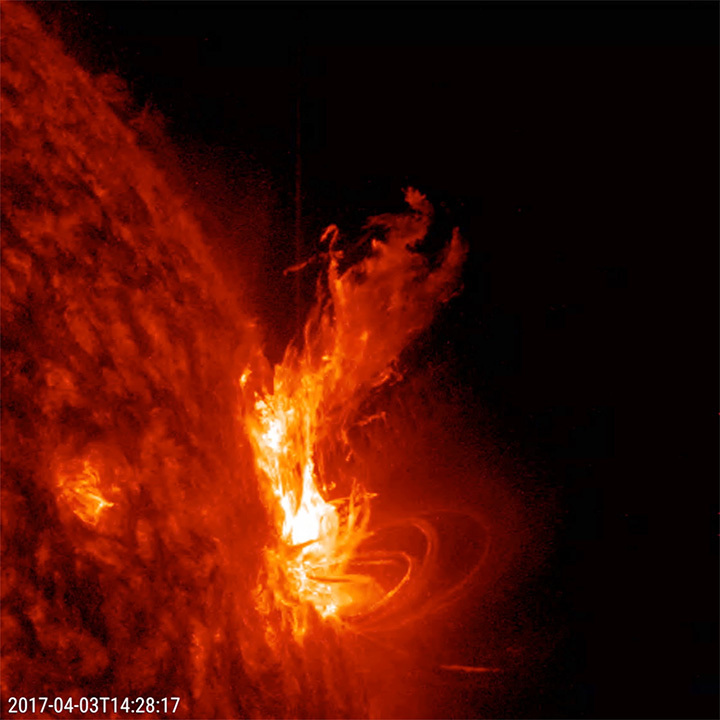 The most dramatic flare occurs about half way through the video clip, when it shoots up a bright towering plume of plasma. Solar flares are powerful bursts of radiation. Harmful radiation from a flare cannot pass through Earth’s atmosphere to physically affect humans on the ground, but they can disturb the atmosphere in the layer where GPS and communications signals travel. M-class flares are a tenth the size of the most intense flares, the X-class flares. The number provides more information about its strength. An M2 is twice as intense as an M1, an M3 is three times as intense, etc.